Uwe Sieber superlative Computer drive toolset includes USB Device Tree Viewer, an utility surprisingly absent fro TPFC, whose inception lies in "Microsoft 'USBView' sample application found in the Windows Driver Development Kits" (apparently, a source only release, and not at all unlike NirSoft's USBDeview). 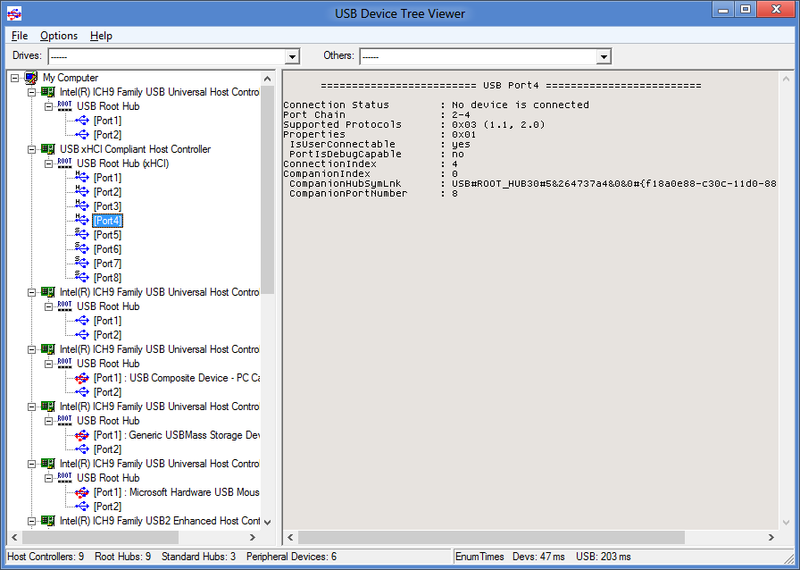 USB Device Tree Viewer is USB3 ready; current version (v2.3.3) can be downloaded from http://www.uwe-sieber.de/usbtreeview_e.html. Last edited by Midas on Sat Jan 23, 2016 3:51 pm, edited 1 time in total. USB Device Tree Viewer v2.4.0 released (see http://www.uwe-sieber.de/usbtreeview_e.html for changelog). USB Device Tree Viewer 2.4.4 has been released. USB Device Tree Viewer v2.6.0 released (changelog and download at http://www.uwe-sieber.de/usbtreeview_e.html). USB Device Tree Viewer at version 3.0.1, version 2 full change log. USB Device Tree Viewer v3.3.3 released (info & changelog: https://www.uwe-sieber.de/usbtreeview_e.html).